Ciderwood produced offspring that are extremely quick to learn and retain the skills and knowledge while maintaining their well-known soft mouths and light sides. His progeny are winners not only in the arena but also in the hearts of those who own and love them. Ciderwood stood 15.2 hands and weighed 1,200 pounds. 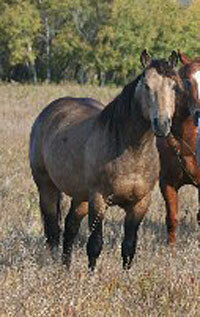 He has consistently produced buckskins, duns and bays with excellent minds and dispositions. He was the living epitome of the modern Driftwood horses. Leo has been siring some really nice foals. All have been sold off the farm as babies. 2007 is the first year we have been able to keep a couple of fillies off him and we are looking forward to starting them in 2009! !